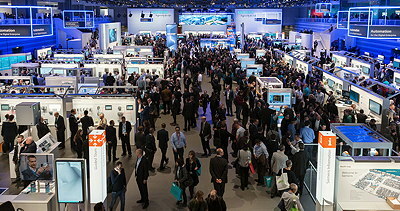 The SPS IPC Drives show which took place last November in Nuremberg, Germany, was the last ever with that name. When the exhibition returns later this year, marking its 30th anniversary, it will be known simply as SPS. While the original name was derived from the German equivalent of PLC, SPS will in future stand for Smart Production Solutions. The organisers argue that a “hardware-centric” name such as SPS IPC Drives “no longer reflects the true core of current and future automation technology” which is shifting to software-based function blocks distributed across a wide range of hardware components. The final event under the old name attracted 1,630 exhibitors and 65,700 visitors to Nuremberg. There were 30 fewer exhibitors and 4,564 fewer visitors than the record numbers achieved at the 2017 show – perhaps reflecting the downturn in the German manufacturing sector. One of the dominant themes at the 2018 event was TSN (Time Sensitive Networking). Suppliers were falling over each other to pledge their support for this technology which promises to bring interoperable, deterministic networking to the shopfloor. In particular, most of the major automation suppliers are backing the OPC Foundation’s initiative to incorporate TSN into OPC UA, thus bringing vendor-independent, end-to-end interoperability down to field-level devices such as sensors and actuators. The aim is to create a globally-supported standard way of linking these devices with the rest of the factory. The show also was notable for the continuing development of technologies for transporting items “intelligently”, speedily and flexibly along production lines and supporting the “batch size one” concept. As well as enhancements to some of the existing technologies, Beckhoff and Rexroth both demonstrated systems which transport components on magnetically levitated carriers. Baumüller has expanded its servomotor portfolio to include water-cooled models which offer high power densities in frame sizes 45 and 56. They are aimed at dynamic applications needing high effective torque. On its stand, Danfoss was demonstrating how its VLT Automation Drive can be used to perform condition monitoring using technologies such as external vibration sensors and load-envelope monitoring. These functions convert the drive into an “intelligent sensor” that detects problems at an early stage and identifies them before they cause downtime. 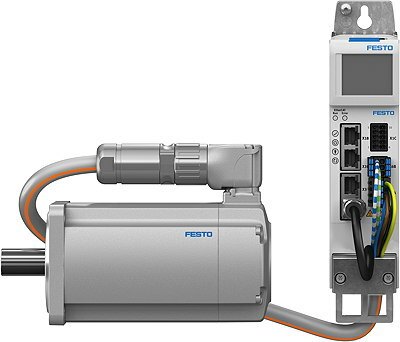 By combining its CMMT-AS servodrive with its EMMT-AS AC synchronous servomotor, Festo has created a drive system (shown below) that it says can be commissioned in three minutes, including attached mechanical systems. An auto-tuning function simplifies commissioning of rotary and linear movements and optimises the behaviour of connected servomotors and linear mechanisms. The system can be integrated via Ethernet with controllers from all major manufacturers. 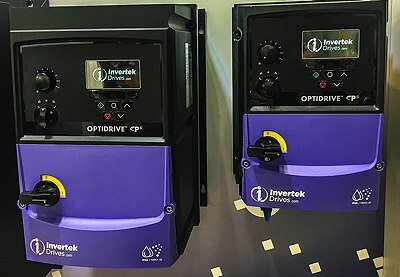 The Welsh drives-maker Invertek introduced IP66-protected versions of its Optidrive Eco fan and pump drives and P2 high-performance drives (below) in sizes 2 (up to 5.5kW) and 3 (up to 15kW) for outdoor use. It also announced a size 5 version of its Optidrive E3 VSD for demanding applications requiring up to 37kW of power. The Danish integrated motor specialist JVL had several additions to its portfolio including a new generation of Nema 23 integrated stepper motors which incorporate encoders, motion controls, and embedded PLCs with eight onboard I/O points that can be configured as digital inputs or outputs, or as analogue inputs. 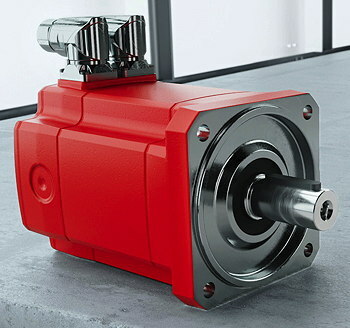 There are ten models of the ServoStep motors with torque ratings from 0.97–3.1Nm, and all offer closed-loop operation, torque control, 409,600 step/revolution resolution, smooth, quiet operation, and speeds from 0–3,000 rpm with a resolution of 0.01 rpm. JVL also introduced a compact Nema 17 integrated stepper motor which supports six Ethernet protocols, incorporates an absolute multi-turn encoder and delivers up to 0.8Nm. The ServoStep MIS171-176 motors have built-in motion controls and up to 254 axes can be connected on the same RS-485 bus. Other announcements from JVL included: a DC version of its 400W MAC400 integrated servomotor for battery or LV operation; a Sercos module with two Ethernet connectors and a switch to support line or ring topologies; an EtherCat module that supports the CiA 402 drive profile; and add-on instructions for setting up JVL’s motors via Rockwell’s Studio 5000 software. Nord was demonstrating an app for commissioning and servicing its drives in conjunction with a Bluetooth stick called Nordac Access BT. The app provides dashboard-based visualisation for troubleshooting the drives. There are also oscilloscope, backup and recovery functions. Schneider Electric unveiled an IP66-protected version of its Altivar Machine ATV320 VSD which can be used outside of a control cabinet, next to or on a machine. Available in ratings up to 7.5kW, the IP66 drive can operate in temperatures up to 55°C. It avoids long cable runs and can reduce cooling requirements in cabinets. SEW-Eurodrive launched a series of high-inertia servomotors for applications requiring a low ratio of load-moment-of-inertia to motor-moment-of-inertia. The CM3C motors (below) come in four sizes (63–100) with standstill torques from 2.4–38.5Nm. As well as SEW encoders, they support Drive-Cliq, EnDat 2.2 and Hiperface DSL, and offer two brake versions: a 24V holding brake; or a high-capacity version for service or emergency braking. There is a single-cable connection option. Siemens announced a plug-and-play module that links up to eight of its LV inverters to IT systems and the cloud. The Sinamics Connect 300 is an IoT gateway with a dedicated LAN connection which connects to a terminal block. It transmits parameters and operating data without needing any modifications to the drive hardware or firmware. Siemens is developing an app called Analyze MyDrives for its MindSphere cloud platform that will monitor drives’ power consumption, torque and frequency and decide when maintenance is needed, avoiding the need for fixed-interval servicing. Siemens is also extending its Sinamics S210 single-axis servodrive family with several variants from 0.4–7kW. The first to be available offers 0.4–1kW from 400V AC. There is an optional busbar trunking system and a shared DC link coupling that supports energy equalisation during dynamic reversing. The drives can be commissioned using built-in Web servers or Startdrive in TIA Portal. Stober was promoting its recently launched SE6 safety module developed in conjunction with Pilz for use in its SD6 drive controller, for safe monitoring of applications up to SIL 3 / Pl e.
WEG completed the staged rollout of its WG20 family of geared motors (below) with helical, parallel shaft and helical-bevel versions, each in three sizes, with ratings up to 18kNm. The gearboxes can be combined with motors from 0.12–75kW and efficiencies up to IE4. They can handle almost any supply voltage and can operate at 100 or 120Hz with VSDs. WEG also presented a family of medium-voltage (2.3–8kV) modular VSDs that it is producing in Portugal as cabinet-mounted packages that include isolating switches, protective devices and multi-level feed transformers. The MVW3000 drive systems cover power levels from 280–2,400kW and achieve efficiencies of 95% across the entire speed range. WEG was also showcasing the latest developments in its Motor Scan condition-monitoring technology which captures operating data from any number of motors in real time and can be used to schedule predictive maintenance via an Android/IoS app. Currently the data is transferred via Bluetooth. A Wi-Fi option will be added later this year, and the system will be extended to monitor motor bearings. Beckhoff extended its portfolio of tiny PC-based control systems by fitting a 32-bit, 400MHz Arm Cortex-M7 CPU and 12 configurable I/O into a package measuring 49 x 100 x 72mm. The CX7000 Embedded PC runs TwinCat 3 software which can be used to configure the eight digital inputs and four digital outputs to operate as counters, dual incremental encoder inputs, dual analogue inputs or dual PWM signal outputs. The basic 512MB of flash memory can be expanded up to 8GB. 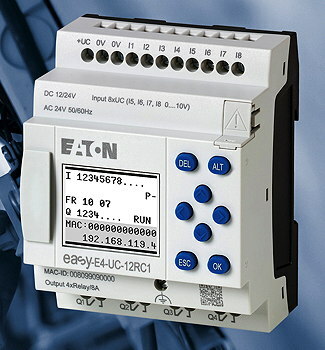 Eaton presented a new generation of its Easy series of control relays, called the easyE4 (below), which replace the earlier easyx00 series. The base unit comes with 4 digital outputs, 4 analogue/digital inputs with 12-bit resolution and 4 fast digital inputs that can be used as counters. A choice of 14 base and expansion modules (fewer than before) support expansion up to 188 I/O. Moog launched a multi-purpose motion controller for electric and hydraulic applications with analogue or digital interfaces, and high-speed communications for short cycle times. The MSC III controller uses standard software and motion control libraries and supports all of the IEC 61131 programming languages. There are debugging and visualisation options. 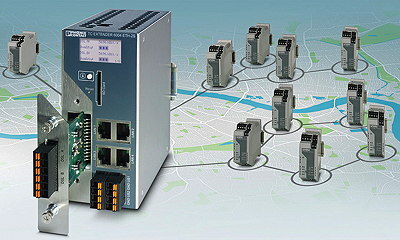 A new PLC system from Rexroth uses around 20 automation and IT protocols to connect machines to higher-level IoT systems. The ILC system is based on the IEC 61131-3 languages but users can also program functions in higher-level languages, accessing the control hardware directly. The system includes predefined function blocks that users can join to form motion sequences at the click of a mouse. Automated PLC code generation helps to create automation tasks. Also new from Rexroth is an embedded controller for PLC, CNC, motion control, robotics and hydraulics applications. The XM42 has a dual-core CPU and offers internal cycle times as short as 0.25ms. It is claimed to handle applications that previously needed two or more controllers, simplifying installations and cutting costs. An OPC UA server is built in and up to 192 axes can be controlled using software packages. 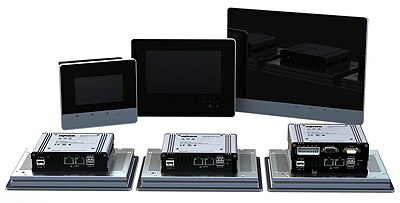 Rockwell Automation has a new range of graphic terminals in sizes from 7–19 inches and with widescreen, touch and keypad options. The Allen-Bradley PanelView 5510 HMIs support Ethernet/IP, while device-level ring and embedded switch technologies help to provide network fault tolerance and cut downtime. SEW-Eurodrive announced a “progressive” controller based on its modular CPC (Cyber Physical Controller) platform which includes scalable CPU modules, fieldbus options and Wi-Fi variants. A software layer model based on Hypervisor technology is said to allow reactions between the real-time controller and higher-level functions such as visualisation, condition monitoring, diagnostics, and smart sensors. A memory card carrying key data such as firmware, applications and usage data, allows the controller to be replaced or upgraded easily. 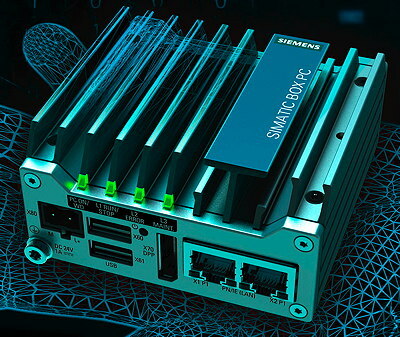 Siemens is taking on Beckhoff in the mini industrial PC market with a with a Windows or Linux device that occupies just 300cm3. 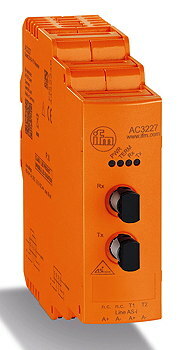 The metal-cased Simatic IPC127E (below) can be used as an IoT gateway, managing data in production areas. It has a two or four-core Atom CPU with 2 or 4GB of RAM and a solid-state drive of up to 128GB. There are three LAN and four USB ports. 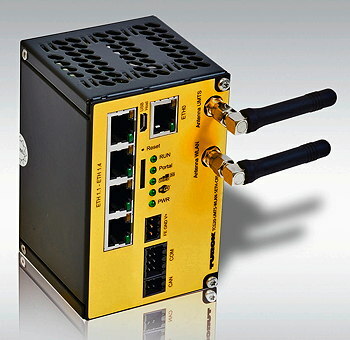 Turck was showing a range of Linux-based HMI/PLCs with 800MHz multicore processors. The TX700 devices are aimed at more complex control tasks and visualisations than the previous TX500 series. Available with touchscreen displays from 5–21 inches, the HMI/PLCs support gesture control. Another company offering a range of touchpanels was Wago whose new Touch Panels 600 (below) offer a choice of Web Panel, Visu Panel or Control Panel variants. The latter can be used as IoT touch controllers that send data from the field level to the cloud. Based on multicore Cortex A9 processors and Linux, they offer a choice of resistive or multitouch capacitive screens. Wago has also enhanced the capabilities of its PFC200 controllers by adding EtherCat support to second-generation versions, increasing “significantly” the number of field devices that can be addressed. The new versions can integrate EtherCat slaves into control systems. Yaskawa unveiled a new generation of Windows-based Panel PCs which, it claims, are up to three times faster than before. The new panels – available in 10, 15 and 21 inch versions – have 2GHz Intel J1900 quad-core CPUs and come with 2 or 16GB or RAM. Beckhoff announced a new generation of scalable safety controllers which allow safety applications to be distributed across multiple TwinSafe Logic-capable I/O modules. This allows more flexible, modular architectures to be implemented and makes it possible to adapt systems to the needs of an individual machine. The new I/O modules include: digital terminals with 8 safe inputs; IP67-protected modules with 8 safe inputs and 4 safe outputs; and safe potential supply terminals with 4 safe inputs and one safe output. Eaton has added new ranges of multicolour LED indicator lights to its RMQ family that can be used to display different signals. There are two versions: an encapsulated plug-and-play indicator with IP69/65 protection suitable for harsh environments; and a version for Eaton’s SmartWire communication and connection system which can display up to 16 million colours, and allows users to set different flashing frequencies as well as colours. Eaton also unveiled “flat” versions of items from its RMQ family of command and signalling devices, including pushbuttons, indicator lights and e-stop buttons. The slimline housings are available for both 22.5mm and 30mm diameter devices. Murrelektronik has extended its modular Micro Pro current-monitoring system (below) by adding switched-mode power supplies with outputs of 5A or 10A, which integrate into the system, thus replacing power modules and saving space in control cabinets. Currents of up to 20A can be achieved using a parallel mode. Murr has also added new versions to its Modlight Illuminix series of LED-based machine lighting systems, which loop power through the lights, allowing them to be connected in series and simplifying installation. 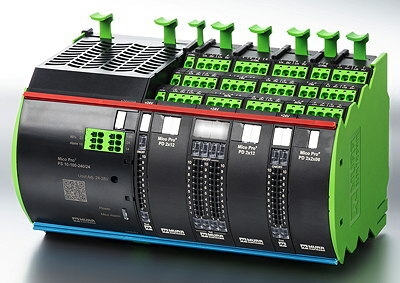 Phoenix Contact has a new hybrid motor starter (below) that stops connected motors after an emergency stop up to PL e. Using a DIN-rail connector, a group of the Contactron pro starters can be shut down without needing extra wiring. An optional module allows motor status to be monitored remotely. Pilz is now offering its PSENopt II light curtains in body protection versions (in addition to the existing finger and hand protection versions). The new PL e curtains offer protected heights of up to 1.5m, ranges of up to 55m and shock resistance to 50 g. New mirror columns are available to monitor up to three sides of a hazardous area using one pair of light curtains and two mirror columns. Just months after launching its new VX25 large enclosure system, Rittal has already announced extensions, including a corrosion-resistant stainless-steel version, and a Nema 4X version that offers IP66 protection. 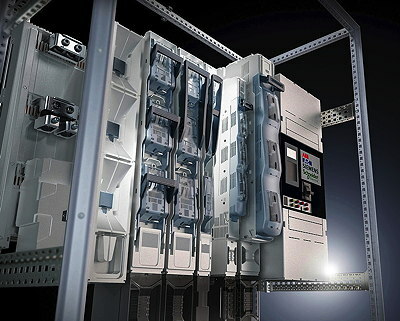 At SPS, Rittal was also promoting the use of its encapsulated 185mm Ri4Power busbar system in the VX25 enclosures (below) using kits that avoid the need to drill holes. It is similarly easy to install the Ri4Power ISV system for facilities management applications. Rittal also announced enhancements to its Blue e+ series of cooling systems, including IP55 stainless-steel versions with cooling outputs from 1.6–5.8kW, aimed in particular at food, beverage and process applications. There are also new roof-mounting versions of the Blue e+ with cooling outputs of 1.3kW for enclosures from 800 x 600mm upwards. These versions allow the heat to be routed above the enclosures and are said to be ideal for dissipating heat from top-mounted components such as drives. 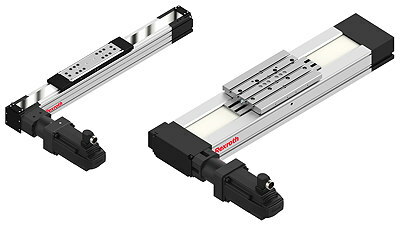 Rittal also added new components to its RiLine Compact busbar system including: space-saving 22.5mm-wide motor controls that combine starter and reversing functions and come in ratings of 0.6, 2.4 and 9A; 45mm-wide infeed adaptors with parallel mechanical and electrical contacts for connecting cables up to 50mm2 and for currents up to 125A; and 18mm-wide single-pole adaptors for circuit-breakers in 16A and 63A versions. Finally, Rittal announced an automated wire-processing system that it claims will deliver an eight-fold increase in processing speeds. The WT Wire Terminal can handle up to 36 different wires with cross-sections from 0.5–2.5mm2. Rittal says that wiring accounts for about half of the work in cabinet building. Schmersal revealed a new line of IP69K-protected safety light curtains and grids that can withstand high pressure and temperature washdowns. The IP69K SLC/SLG 440 devices incorporate a dirt indicator that displays a warning if the sensor reception degrades. 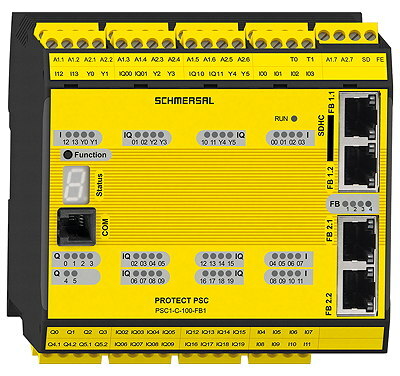 Schmersal has now added an OPC UA server to its Protect PSC1 programmable safety controller (below), allowing devices including sensors to provide data that can be used in applications such as maintenance. Schneider Electric unveiled a system for monitoring filters and airflows in multiple panels or cabinets, helping to cut downtime and filter-related costs by up to 90%. The ClimaSys Smart Ventilation System collects and analyses data from filter and fan sensors and displays a system’s status via multi-colour LEDs. The data can also be sent to PLCs, drives and HMIs. The system monitors fan speeds and currents as well as temperatures. A filter with a built-in dust sensor used a patented infrared technology to determine dust accumulations. Schneider has also added 55mm-wide 73A and 80A models to its TeSys GV3 series of thermal-magnetic motor protection circuit-breakers. The GV3P73 and GV3P80 breakers are 35% smaller than previous TeSys models and are suitable for IE3 and IE4 motors. They offer direct connections to PLCs. Sick was demonstrating a safety light curtain specifically developed for aseptic filling and sealing machines used in the pharmaceutical and cosmetics industries. The Twinox4 curtains, housed in stainless steel, are designed to resist aggressive cleaning and decontamination agents. 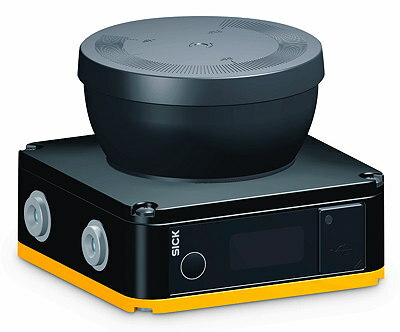 Sick also has a new 8cm-high safety laser scanner for applications where space is extremely tight. The 2D nanoScan3 sensor (below) offers programmable and dynamically adapting protective fields to SIL2 / Pl d. Another new safety laser scanner, the outdoorScan3 is said to be first certified to IEC 62998 for use outdoors. It will work in sun, rain, snow or fog, for example allowing AGVs to navigate safely through outdoor environments. Turck has a TÜV-approved, IP65-protected “safety box” designed to connect currents of up to 9A safely in the field. The TBSB box is linked to a safety device such as Turck’s TBPN/TBIP safety hybrid module – which combines 4 safety and 4 standard I/Os in an IP67 module – or to similar devices from other manufacturers. Wago was demonstrating two slimline rail-mounting power supplies – an 18mm-wide device (787-1200) that delivers 0.5A at 24V DC, and a 38.5mm-wide model (787-2850) that offers 1.25A at 24V DC. The latter as an efficiency of up to 88% and is said to occupy a third less space than standard supplies. 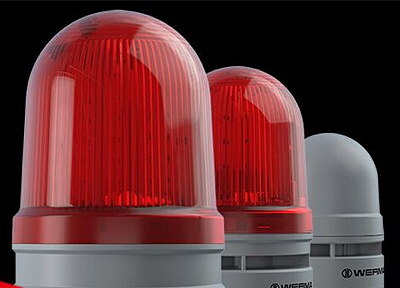 Werma announced a new family of modular LED beacons in three housing sizes that, it says, will simplify the selection of such devices and will need 20% fewer parts numbers than their predecessors. The IP66-protected EvoSignal beacons (below) are available in optical-only versions, or combined with audible alarms with outputs up to 110dB. Altra group member Matrix has expanded its SMB range of a servomotor brakes (below) with 5 and 32 Nm models that use a proprietary new friction material said to ensure stable static and dynamic torque up to 120°C, with good wear resistance. Another Altra member, Stromag, launched a range of modular electromagnetically operated brakes for challenging environments. The HPB brakes are available in two- or four-face configurations with brake torques from 80–5,000Nm and activate automatically in the event of a power failure to hold or stop loads. B&R has added five safety functions (STO, SLS, SLF, SDI and SMS) to its AcoposTrak transport system, limiting the speed of the system’s shuttles as they pass manual workstations. The limit values for safe speed and force are calculated dynamically at runtime and can be deactivated. The speed calculations take the speed of the shuttle into account. A safe set-up mode can be implemented, with the system speeding up when the it is in full operation. 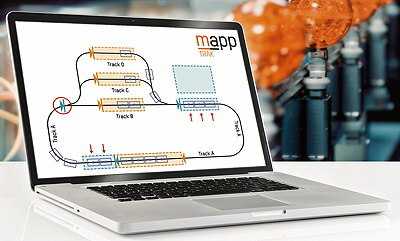 B&R was also demonstrating its mapp Trak software (below) that creates AcoposTrak applications using process-oriented programming with users defining rules for how shuttles should behave. The software, used for both simulation and real-time operation, ensures that the shuttles do not collide, cross virtual barriers or violate speed limits. Dunkermotoren used SPS to launch a series of three-phase tubular linear motors that deliver up to 3.69kN and accelerate faster than 200m/s2. Water cooling can double the forces. The SA/SC 38 series is available in actuator or component versions. A Sin/Cos encoder is built in and others (SSi, BiSS and TTL) will be added later this year. Festo demonstrated a compact cantilever axis with a toothed belt that, it claims, can halve vibrations and cut cycle times by 30%. The rigid ELCC-TB axis has a stroke of up to 2m, and a low moving mass to speed operations. The axis can be used horizontally or vertically. Mayr presented new versions of products for monitoring safety brakes and decelerating machines smoothly. Its Roba-brake-checker is now available in an AC version and will soon be enhanced to combine switching condition monitoring and brake control in one device. Mayr’s Roba-torqcontrol module allows adjustable braking, bringing machines to a defined stop, independent of their loads. It changes the braking torque during operation by varying the current and voltage, and allows control loops and brake movements to be performed “intelligently”. Using its latest synchronous servomotors, Rexroth has produced a range of compact toothed-belt-drive axes which, it claims, produce speed and dynamics that were previously only possible using linear motors. The MKR, MLR and CKR axes (below) can achieve speeds of 5m/s and accelerations of 50m/s2 in ball-rail versions, and 10m/s with cam rollers. The axes, in lengths up to 9.4m, can be up to 40% cheaper than linear motors, even for medium-length strokes. Schneider Electric has collaborated with Stäubli to offer a four-axis Scara robot that uses its PacDrive 3 motion control system, and is programmed using IEC 61131-3 languages and preconfigured libraries, avoiding the need to learn specialised robot programming. The 8kg-payload Lexium STS robot is suitable for high-speed tasks with short cycle times. It is embedded into Schneider’s EcoStruxure architecture, reducing cabling, interfaces and space requirements. SEW-Eurodrive was showcasing a range of modular planetary servogears that can be customised to suit an application. The helical gears of the P5.G to P7.G series cover the torque range 20–6,500Nm in six sizes. The rotational clearance is three angular minutes, or one in reduced-backlash versions. A flexible coupling adaptor from Siemens can connect different types of Simogear gearbox to various servomotors, rather than needing a dedicated adaptor for each motor. The backlash-free KS adaptor (below) is available for helical, parallel-shaft, helical-bevel and worm gears, initially for use with Simotics A-1FL6 servomotors and later for other Siemens motors and most gear sizes. Siemens says it will simplify handling, cut downtime and costs, and optimise stock-keeping. Steute has developed a device to monitor the alignment of conveyor belts. The ZS 92 alignment switch (based on a new emergency pull-wire switch) uses a stainless-steel roller level to detect when a belt is not running centrally (as a result, for example, of uneven loading). It can correct the alignment or stop the system. The switch has staggered contacts with adjustable switching points. 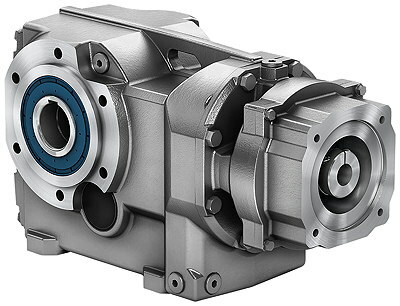 Wittenstein has a new series of compact planetary and right-angle bevel gearboxes as part of its alpha Basic family. The CP gearboxes come in five sizes and particularly suitable where space is tight. They achieve torsional backlash of less than 12 arc-min in coaxial versions, and 17 arc-min in right-angle versions. Balluff announced a series of IP68 metal-body inductive switches incorporating a patented new technology said to ensure precise switching in challenging environments. The Factor 1 switches in M18 housings (below) can detect changing objects (including steel, aluminium, copper and brass) with no difference in switching distance. They are said to be reliable even when in direct contact with objects. Balluff also has a new range of inductive sensors approved for use in all Ex zones. 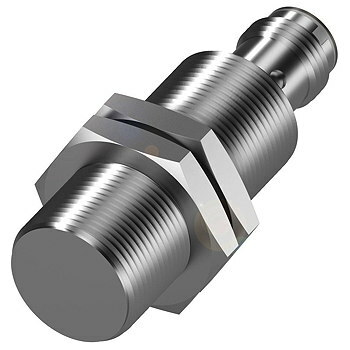 Available in M12, M18 and M30 housings, the sensors include full-metal versions for use in harsh environments and high temperatures. 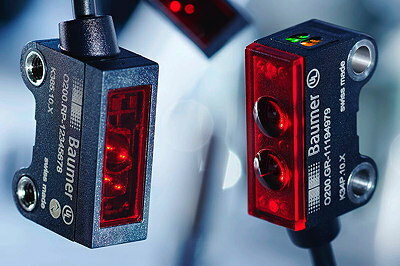 Baumer announced a family of miniature optical sensors which are said to be immune from interference from ambient light or other sensors. There are 130 variants of the IO-Link-supporting O200 sensors (below), which incorporate a high-power mode for detecting black, light-absorbing objects, even over long distances. They are claimed to be the first sensors with CAD data embedded in their beams. Baumer has also expanded its XF Verisens vision sensors with models using the ColorFex technology to simplify colour checks. The 700/800 models combine colour checks, 1D and 2D code reading, and OCR/OCV text reading in a compact devices with built-in lenses and lighting. ColorFex identifies object colours and shades and visualises them in 3D. Beckhoff has introduced an “economy” line of EtherCat measurement modules for precision measurements to an accuracy of 100 ppm. The ELM314x modules are available with 2–8 channels and each channel can be used for current or voltage measurements with sampling rates up to 1 ksps. They can process analogue signals from ±1.25V to ±10V, 0–10V, ±20mA, or 0/4–20mA. Ifm announced a series of magnetically-coded sensors for non-contact monitoring of movable guards. The MN2 and MN5 sensors (below) can be activated from different directions and concealed behind stainless-steel or aluminium to prevent tampering. The sensors can be combined with evaluation systems to create TÜV-certified safety sub-systems to PL e / SIL 3. Schneider Electric has developed a device that transmits binary sensing signals, such as those from limit switches, over distances of up to 50km with low energy consumption. The Telemecanique XIOT cloud sensor users a low-power, wide-area network operated in 32 countries by Sigfox to transmit switching states via the cloud, thus generating early warning messages from remote sites. It is independent of GSM networks and is powered by a lithium-ion battery with a life of up to ten years. Sick unveiled a tiny (55 x 55 x 77mm) 3D streaming camera with an on-board technology called ROCC (rapid on-chip calculations) that can provide up to 14.4 gigapixels per seconds, enabling full-frame (2,560 x 832 pixels) 3D imaging at 7kHz. The Ranger3 camera forwards the processed data to a PC via Ethernet, reducing the need for post-processing. It can perform accurate 3D measurements of different object heights at the speeds of the fastest production lines. 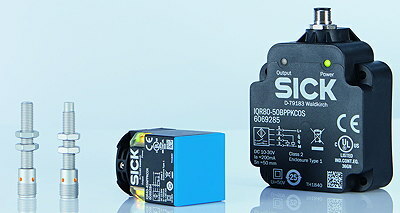 Sick also announced a family of IP68 inductive proximity sensors with sensing ranges of up to 75mm (three times longer than usual) allowing them to be mounted in a safe position. The IMR sensors (below), which come in various cylindrical and cubic housings, have an identical sensing range for all non-ferrous metals. There are no ferrite cores, protecting the sensors from the effects of electromagnetic interference or weld spatter. Turck is expanding its family of miniature ultrasonic sensors with ten IP67 models in M8 and M12 formats. The M8 sensors offer a choice of diffuse or opposed modes (in PNP or NPN), have range of 100mm and a blind zone of 20mm. The M12 sensors include four versions with analogue outputs and two with switching outputs and IO-Link. There is a choice of 200 or 400mm ranges and 20 or 40mm blind zones. Also new from Turck is an expanded range of iprox inductive sensors with one-piece threaded plastic barrels and “factor 1” operation (the same switching distance for all metals). They come in flush and non-flush versions in M12, M18 and M30 diameters, with translucent end-caps that allow status signals to be seen from any direction. 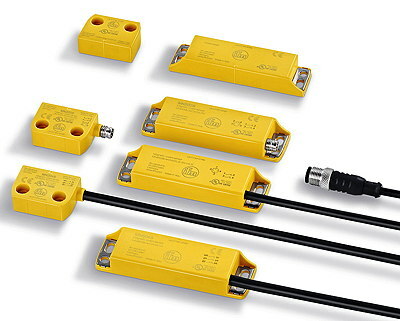 Finally, Turck has extended its contactless Li Q25 linear position sensor family. With measuring lengths from 100mm to 2m, the IP67 sensors are said to out-perform magnetostrictive linear sensors which sense more slowly as the measuring length increases. A 5kHz scan rate minimises positioning errors. Outputs are supplied as both 0–10V and 4–20mA signals. There was a host of new arrivals on the Belden stand including: a range of entry-level rail switches with built-in Power-over-Ethernet Plus (called Spider III PoE); a family of full-Gigabit Ethernet PoE managed switches with an L-shaped IP67 housing for efficient cabling and cabinet-free mounting (Hisrchmann Octopus OS40); a new version of Hirschmann layer 3 backbone switches with four or eight ports, that can be set for speeds of up to 2.5 or 10 Gb/s (Dragon Mach4000/Mach5000); and an expanded range of DataTuff Cat 6A Profinet cables with a four-pair, Type C design that ensures reliable data transmission at up to 10Gb/s. HMS Industrial Networks announced the availability of OPC-UA server/client functions for its eWon Flexy remote access and data gateway, allowing users to collect data from devices and machines easily and securely as well as cutting configuration times and costs. The server also acts as bridge to IT systems such as Scada, MES and ERP. Users simply choose the group of tags/parameters to be published by the server and the data can be retrieved by any OPC-UA client. Ifm unveiled an AS-i fibre optic repeater which can transmit AS-i signals over distances up to 3.2km, extending the range of these networks and supporting topologies such as line and star. The repeater (below) has two electrically isolated channels for transmitting and receiving. Optical transmission avoids problems such as interference, earthing, and distance-related losses due to inductance, capacitance and resistance. Mixed operation of flat AS-i cables and fibre optics is possible. Murrelektronik has released a range of rugged fieldbus modules with L-coded M12 power connectors, designated by Profibus & Profinet International as the connector technology of the future. The M12 cordsets for the MVK Metal and Impact67 modules can carry 16A – 77% more than the larger 7/8” connectors – allowing many sensors and actuators to be connected without needing extra power supplies. IO-Link ports on the master modules can be used for traditional I/O as well as IO-Link sensors and actuators. Pepperl+Fuchs has produced a gateway that not only provides Profinet functions but also offers access to any connected Hart devices, allowing Hart auxiliary variables to be used as a second measuring value. The LB Profinet gateway allows diagnostic data from field devices to be read out via Hart IP, and can run Profinet and Hart IP protocols on the same cable. Up to 80 field devices can be connected to a remote I/O system. Phoenix Contact launched a range of managed Ethernet extenders which allow all paths and connected devices to be monitored remotely. The TC extenders (below) use existing two-wire cables for networking, with transmission ranges of up to 20km per extender segment. Up to 50 extenders can be added to a network to create line and ring topologies automatically, without needing configuration. Surge protection is built in and can be monitored remotely to determine when it needs to be replaced. Siemens announced a “future-proof” network management system that can centrally configure, manage and monitor networks of 50–12,500 participants. The distributed Sinec NMS can adapt to all types of network. New components can be integrated into a network, and existing devices can be reconfigured and maintained. Siemens is also extending its Scalance SC-600 series of industrial security devices for better and simpler protection of production networks. The devices now have bridge firewalls, allowing them to be used in flat networks, support redundant network structures, and allow user-specific firewalls. Softing was demonstrating an enhanced version of its Analyzer IE commissioning and diagnostics tool for Profinet networks. The new Analyzer Pro includes a Tap (terminal access point) called profiTap which records network parameters such as jitter, load ratio and device update rate, which cannot be determined by communicating actively with devices. Using profiTap, all packets travelling to and from a controller are analysed and network communications are recorded. Turck is expanding its IO-Link portfolio with IP67-protected Class A and B I/O hubs and HF RFID read/write heads with threaded barrels. Using Sidi (Simple IO-Link Device Integration), the new devices can be configured directly from a Profinet engineering system. The range includes: 32mm Class I/O hubs for connecting eight digital signals to an IO-Link master; Class B hubs with eight M12 sockets for sensors and actuators; and cylindrical HF RFID readers with IO-Link interfaces. Turck was also showing IoT gateways for connecting machines, plants and remote measuring points to automation networks via the cloud. The TCG20 gateways (below) come in three wireless variants: UMTS; dual-band Wi-Fi; and simultaneous UMTS and Wi-Fi. They include an RS-232/485 port; a Can port; and up to five Ethernet ports. They also support Modbus TCP and RTU as master and slave, OPC UA as a client and server, and Codesys network variables. They are configured online via a built-in Web server. Wago introduced a new version of its Modbus TCP fieldbus coupler. The new version (750-362) supports both Modbus UDP and TCP and is said to start much faster than before. The coupler connects Wago’s 750 series I/O modules to Modbus. Wago also previewed a cloud system that will allow its 750 I/O system and 750 XTRT to connect to the field level, and a PFC controller to send data to the cloud. The data converges in the cloud and can be used for analysis. At SPS, ABB was previewing an application that will help users to manage and protect their assets through predictive and preventive maintenance. The Asset Management application, due to be released in the second half of 2019, performs real-time condition monitoring of equipment to reduce downtime. It uses machine learning and artificial intelligence to analyse problems and optimise performance. Belden has released what it claims is the first complete system for configuring and using TSN (Time Sensitive Networking) in industrial Ethernet networks. It combines TSN firmware updates for Hischmann’s RSPE and Octopus II Ethernet switches with its HiVision 8.0 network management software, which integrates TSN configuration with supervision functions. TSN systems can be configured without needing to log into each device to set parameters such as time synchronisation and TSN scheduling. B&R announced its first cloud application based on ABB Ability. Asset Performance Monitor gives OEMs an overview of their machines in the field, allowing them to identify potential improvements and unlock new revenue streams. For example, the software delivers data about production rates and energy consumption, calculates KPIs and displays the data on a dashboard. Data is collected from machines by an edge device which passes it on to the cloud using MQTT. 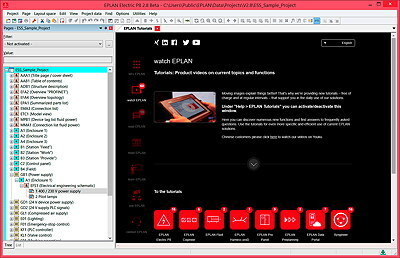 Eplan unveiled a new version (2.8) of its Electric P8 software with a new graphical interface (below), improved round-trip engineering with Siemens’ TIA Portal, enhanced macro technology, and a built-in user portal that offers tips and tricks, news, tutorials and training information. A new option allows users to transfer configuration projects to bus ports without having to input the data manually for each port. There is also a new version of Eplan’s Pro Panel 3D control cabinet engineering software which includes automatic migration of projects based on Rittal’s TS8 enclosure system to its new VX25 system. There is also support for 4K displays and a function that makes it easier to replace existing components when cabinet configurations are changed. 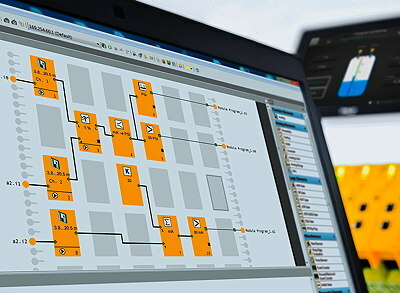 Festo is offering free PC-based software for parameterising, programming and maintaining its electric components. The Festo Automation Suite can help to commission entire drivetrains from mechanical systems to controls in a few steps. 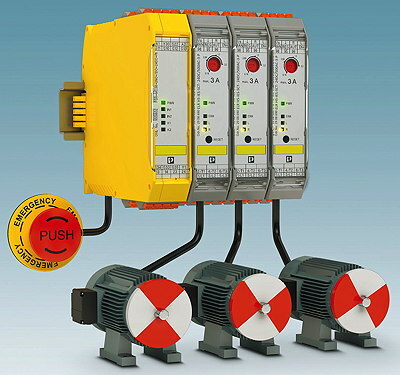 Servodrives can be parameterised and integrated rapidly. The software finds and installs the right plug-ins for each item of equipment. Device description data, manuals and other information can be downloaded without needing to open a Web browser. Jetter presented a new dashboard system that allows users to display key production figures and process data. The browser-based interface can be accessed anywhere via smartphones and tablets without needing extra programs or plug-ins. Mitsubishi Electric was promoting the fourth generation of its Maps Scada software platform with extended connectivity options, additional user tools and more built-in functions. It says that the suite can reduce the time taken to develop and integrate projects, which helping to create smart factories. The latest version (10.9) of Pilz’s PNOZmulti Configurator software (below) allows safe small control systems to be simulated offline without needing hardware, thus detecting, analysing and remedying errors at an early stage. The simulation function can be used to test user programs for safe monitoring of machines before they have been commissioned. Users can ensure that safety control systems are error-free before an application goes live. 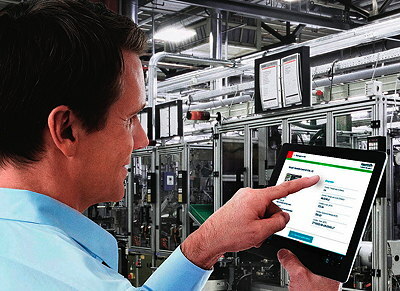 Rexroth has developed an iOS/Android app (below) that allows maintenance workers to access wirelessly read error messages and service information from machines equipped with its control systems. The Digital Service Assistant (DSA) identifies components and allows spare parts to be ordered or repairs to be carried out rapidly. Schunk claims to be offering the first 3D configurator for gripper/swivel devices. Users can make adjustments to a 3D preview before downloading 2D or 3D CAD files in common formats, or 3D PDFs. The software also generates parts lists. “Intelligent” logic ensures that only feasible combinations are displayed. 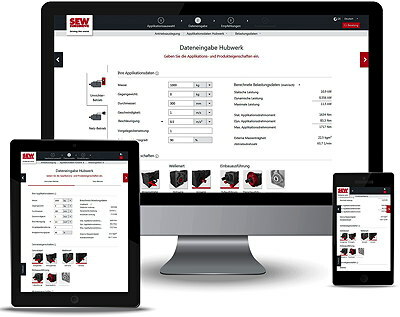 SEW-Eurodrive has an online gearmotor selection tool that helps users to check which gearmotors are appropriate for an application. The Web-based Drive Selection tool (below) guides users through the first design steps and allows them to check how changes to application data may affect the load on a drive. Designs can be transferred to product configurators or to shopping carts. Siemens was demonstrating a free 3D graphical configurator for its Sivacon 8MF1 system cubicles, which come in 90 sizes and include 2,000 combinable elements. The configurator uses drag-and-drop techniques to create realistic 3D visualisations of the cubicles. It can include customisations such as special colours or cutouts. The software checks all combinations according to predefined rules. The data generated can be exported as 2D or 3D CAD models. Finally, Wago has added several new functions to its e!Cockpit development environment, including a new topology view that gives an overview of complete physical structures. The software can also turn a Wago PFC controller into an EtherCat master. Wago says that integrated telecontrol configurators for DNP3 and IEC 60870 slaves will open up new applications. The first show under the new SPS banner will take place from 26–28 November, 2018, in Nuremberg, Germany.